I’m in early discussions with the people at St.Croix Festival Theatre about donating another evening of story reading with all proceeds going to Festival. LaMoine MacLaughlin and I did this last year and there were calls then for a repeat this year. It’s easy money for the theatre; all we need is a dead night for the theatre, some lights, ticket takers and Peter, who’ll scrounge up a chair, side table and a lamp to suggest a comfortable reading room. If this happens, I’ll limit the reading this year to just two stories. Last year I did three and I felt it went too long. As of Valentine’s Day, the day of the official end to 50 years of ministry in our area by Good Samaritan Society-St.Croix Valley that was brought about by the purchase of the nursing home by Plainview Health Partners, I was out of a job. Chaplains were cut from the employee roster. I didn’t hear that from the new owner, who has not connected with me yet, but by phone from my colleague, fellow chaplain Chuck Arndt. He had a face-to-face with the new owner. Fortunately, the Lord has been preparing Marina and me for this possibility. I serve Wolf Creek United Methodist Church quarter time and have fairly frequent fill-in opportunities at other churches. I still do a quarterly series of national ads for a client of more than 30 years standing. On top of those things, our downtown Osceola office building is supposed to close for its sale on March 1st and the bedroom and additional downstairs room we’ve added to our Bone Lake cabin is close to being finished. In the event that finances force a consolidation and a move, we have a place to go that we enjoy already. So the plot thickens. What I would like to see is a gigantic uptick in sales for my short stories, both the Kindle versions and the paperbacks. I am grateful for the two days of unstructured time I now have and I’m praying that I will use that time wisely. One thing that may happen is that I may be able to produce more fiction; much creative energy lately seems to have gone into sermons, rather than into stories. So we shall see. I, for one, will be staying tuned! The Second Gathering is in print! In the meantime I’ve done two more short stories, “I Loved That Bike!” and At Midnight’s Stroke”. I’m mid-way through another “mangled” fairy tale, “Snow Job and The Four Dwarfs”, so just you wait! I’ve also done two new stories, one of which will be read in January at the Northern Lakes Center when authors read their stuff from the Center’s publication “Soundings”. The newest one will be inflicted on the writers’ group there in early January. 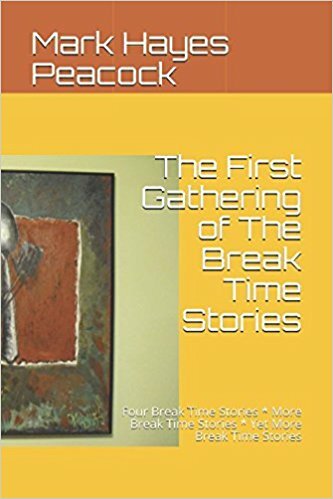 The “Soundings” story will get its recording this week for broadcast on WPCA-FM along with “Green Card” from the third collection, “Yet More Break Time Stories”. Hey, the soup was good and so was the company. We didn’t have a huge turnout but as I tell people, “Sometimes we go for quality!” The reading went well and the group was attentive, laughing in all the right places and nodding when appropriate. Since I wrote last, things have been overwhelmingly busy. I have managed just two stories since July 1st when I began preaching regularly each Sunday at Wolf Creek UMC. That’s less than my usual story production the past several years. This Saturday is the Open House for the new civic building in Osceola. I’ll be there as president of the Osceola Seniors. The details of getting the Center going and of trying to move the group from a monthly potluck meeting group to a group that operates/schedules/uses daily a designated space, well that has taken up some of my time. In addition, we have construction going at our Bone Lake cabin and I’m always feeling I should be there more often to check on how things are going. Additional hours at the nursing home also have pushed at me and there have been family issues, such as a daughter-in-law losing her mother suddenly that have taken some time, attention and prayer. I’m also running a Bible Study at Wolf Creek on Wednesday nights; that takes prep time. No complaining here and I’m thankful that God has made me strong. Life’s realities, however, dictate that I can keep this pace only so long. I have 1 1/2 years left of my Seniors term and that will end. Maybe someone young will move into our townhouse and I can offload my treasurer/secretary duties. Or I may be “riffed” by the new nursing home owners. Or Wolf Creek UMC may die, despite our best efforts. Or God may simply say, “Enough!” and I’d better obey. Meanwhile, I’m staying tuned. I read my latest short story, “At Midnight’s Stroke” Monday night to the writers’ group at the Northern Lakes Center for the Arts in Amery. This is the first piece of fiction I’ve been able to write since I began pastoring again regularly on July 1st of this year. The creativity seems to have been channeled elsewhere, rather than into fiction. Per usual, there were comments, some of which I’ll heed and others that just don’t fit my sense of where the story needs to go. This may well be the first story of Kindle book #6. My son John helped pull the dock from the lake yesterday. The sun shone but there was enough of a breeze to stir up whitecaps on the lake and the water was damned cold. I do this little chore in my bathing suit. John and I had to retreat twice to the truck to thaw out. Marina had a delicious chicken dinner awaiting when we finished. The job took us the usual half-an-hour or so and it’s great of John to drive all the way from Golden Valley in order to spend a brief time freezing himself. I pulled the pontoon myself last week, but it turns out really to be a two-man job. I got help from some guys from Brenizer Motor Sports up in Frederic who were pulling boats and docks at Wilkins. My thanks to them! I do have one other story semi-formed in my head. We will see if it develops into something. Meanwhile, I’m awaiting a “patience seizure” to try to format paperback #2 so it looks decent–better at least than the results with the first book, which has some technical problems that embarrass me. Good Samaritan Society-St.Croix Valley nursing home in St.Croix Falls has been sold to Plainview Health Partners. This has blind-sided everyone at our facility, including residents, their families and our staff. No one saw this coming and some of my colleagues have expressed great anger and feel we have been lied to for the last couple of years. The official transfer date is December 1st, 2018. For me, it’s a business decision on the part of the buyers, who are taking on just the nursing home operation. The home care, The Lodge assisted living facility in Taylors Falls, and the management of the two HUD apartment complexes in St.Croix Falls will stay with the Good Samaritan Society. It seems apparent that the Society will be keeping the entities that are making money. Nursing homes may be in a trough for awhile until the baby boomers age sufficiently to need skilled nursing care. That’s about 8 years from now, according to some estimates. Meanwhile, we have tough competition from the nursing home/assisted living in Luck and the home in Osceola, as well as an assisted living unit in Osceola with another one planned and about to be constructed there. There’s also assisted living in Centuria. The question, then, is, how do the new owners intend to turn a profit? There’s not much to cut in our nursing home without endangering our residents. Another issue for the buyers is the faith issue. Many or our residents are with us because Good Sam is a community of faith. That goes for many of our staff, too. Our buyers need to look at WHO they are buying, not just What they are buying. A lost employee goes directly to the bottom line. It would be a good business decision to allow our present faith climate to continue as is. I trust the Lord to take care of me and I pray for our staff, residents and their families as we navigate this change. Our son Aaron is in town from Portugal so daughter Alice flew in from Cincinnati to visit with him and daughter Hannah joined us for a meal last night here at home. I’ve not laughed so hard in months! Marina made her usual great stew and we had a grand time together. Alice flitted home this morning, Hannah is up to her usual over-committedness and Aaron is doing client work. I’m trying to clear the deck in the office so I can begin work on stuff needed for Charge Conference, which is the annual meeting that will be coming up for Wolf Creek United Methodist Church. Tonight I’ll listen to myself reading another story on WPCA-FM, which streams it online for people like myself who are out of broadcast range. I’ll listen and I’m sure it will re-confirm that I sound like a geezer. Nevertheless, being able to have a story broadcast each month until I run out my stories to read is a privilege most authors never get! I’d say I had them rolling on the floor laughing–and they did laugh a lot when I read the two “mangled” fairy tales–but the floor action happened prior to the start of our reading. The White Bear Lake Public Library has a very nice community room with rolling chairs that are easy to set up (because they roll, of course!) Unfortunately, when one fellow went to sit in a chair, it rolled away from him and he landed on the floor. Nothing damaged, except perhaps his sense of decency. Anyhow, I read “The Great Experiment” from the Kindle collection “Yes, More Break Time Stories!”, “Little Red Hoodie” from the paperback, “The First Gathering of The Break Time Stories”, and by request another “mangled” fairy tale, “Sinner Ella”, from the fifth Kindle book, “Yes, More Break Time Stories!” Three stories in exactly an hour, right on the button. It was a good gathering, a decent turnout for a rainy night when football was on the TV and it was good to read to some old friends, a few of whom I’ve known for 50 years. I always appreciate anyone who takes the trouble to show up. My thanks to Therese Sonnek and the White Bear Lake Library staff, as well as the Ramsey County Library Board for bringing me into their facility to read. The rest of this week finds me with a piano lesson, the River Road Ramble at the Wolf Creek church, winterizing the fifth wheel and mowing grass at the cabin, writing another series of 13 ads for a client of 30+ years and somewhere in all that making time for our elder son, Aaron, who flies in from Portugal and who is supposed to have a music gig in North Carolina. With the flooding from Hurricane Florence, I’m guessing that event will be cancelled.